Sega Ikebukuro GiGO (セガ 池袋ＧiＧＯ), previously just Ikebukuro GiGO (池袋ＧiＧＯ) is an indoor Japanese arcade owned by Sega. 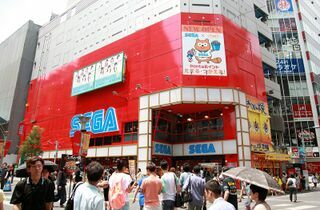 Ikebukuro GiGO is one of Sega's flagship indoor arcades, being one of several housed in the Akirabara district of Tokyo. While it used to identify itself with other GiGO venues as large, inner-city arcades, in recent years the GiGO branding has been dropped in favour of the generic "Sega" look seen across many converted Sega Worlds and Club Segas. For the time being, however, the site still officially calls itself Ikebukuro GiGO. Numerous Sega arcade games are thought to have been location tested at the site, with many going so far as to credit the venue's staff in-game. During its lifespan it has also changed colour - originally red, the building became a unique shade of yellow at some point during the early 2000s, before reverting back to a similar red colour scheme in 2013.